288 pages | 51 B/W Illus. This step by step guide is for those seeking to undertake a transformational change process based on strong collaboration among diverse interests. Guiding transformational change goes beyond small changes to an existing system. It leads to lasting change in the system itself. The collective learning process achieves a systems change through a continuous learning spiral based on open learning among diverse interests. The sixteen case studies cover guided transformational change in personal learning, team-building, community development, organizational change, monitoring and evaluation, and cross-cultural learning. Each transformational change has been treated as a celebration of mutual learning. 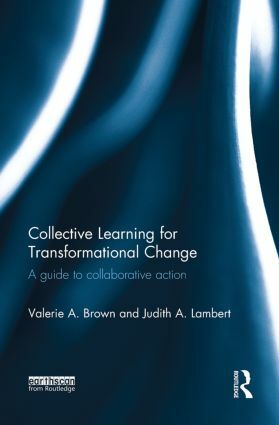 Part one of the book provides an outline of the theory and practice of collective learning. The theory draws on the experiential learning cycle developed by David Kolb. The practice follows the rules of open space learning, dialogue and valuing diversity. The case studies in Part two are examples of collective learning leading to transformational change in a wide range of contexts, from cities to councils to organisations. Part three offers thirty-two activities on which the programme designers can draw in the course of guiding transformational change. This innovative book is of immense value to researchers, students and professionals in the fields of organizational change, organizational behaviour, management education, and sustainability training, education and leadership. Valerie A. Brown is Director of the Local Sustainability Project, Human Ecology Program, Fenner School of Environment and Society, The Australian National University. Judith A. Lambert is Director of Community Solutions, and works in the interface between the social and environmental aspects of sustainable living.